Public spaces are an important asset to our cities. They provide people many opportunities to come together and engage with the community. If public spaces are successful they are inclusive of the diversity of groups present in our cities and create a social space for everyone in the society to participate in. This includes how welcoming the space is and whether people can access the space the way they feel comfortable in. This includes disability access and making a space for everyone regardless of their circumstances to be a part of the society through public space. One good way to ensure public spaces are accessible is to provide good seating in them so that people can enjoy the space for a long time and seek respite (as illustrated in the images below). This is the ability for people to be themselves in the public realm. One of the greatest joys of going to a public space is so that people can express themselves fully. This might involve meeting new people, rekindling with old friends, participating in activities in the space or interacting with the public art in the space. These are all ways that people can be comfortable in the public sphere. 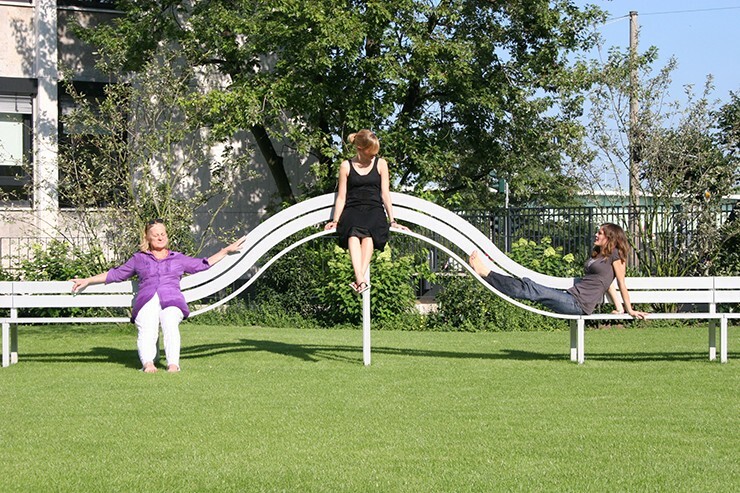 One example of being comfortable in a public space is engaging with public art. 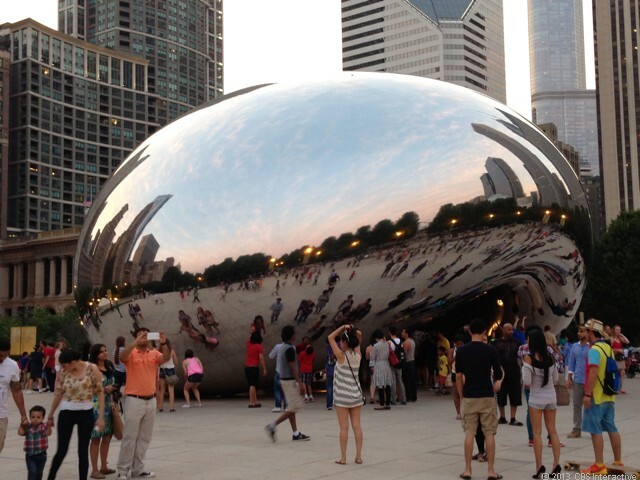 The Bean Sculpture in Chicago is a great example of where people are comfortable to express themselves. Public art tends to create a very comfortable atmosphere for people to express their true selves and interact with the objects while bringing out the best in people. Many scholars in human geography have explored this idea of ‘sociality’ in the public sphere. It is basically the interactions people have in the public space and about the connection this forms between the person and the space. This might include the social networks people form on the street or city squares. Creating an opportunity for people to meet new people in the public space is important because this adds to the sociability of public space. 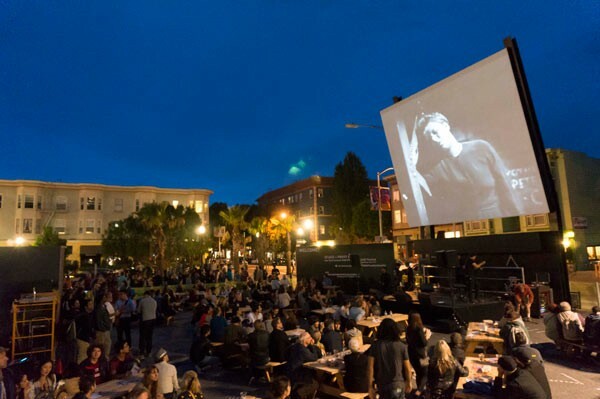 Having social events in the public space such as music concerts or hosting movies are also a great way to get people to engage with one another. This creates an intricate connection between the space and the people in it forming a sense of ‘togetherness’ in the space as stated by Doreen Massey. 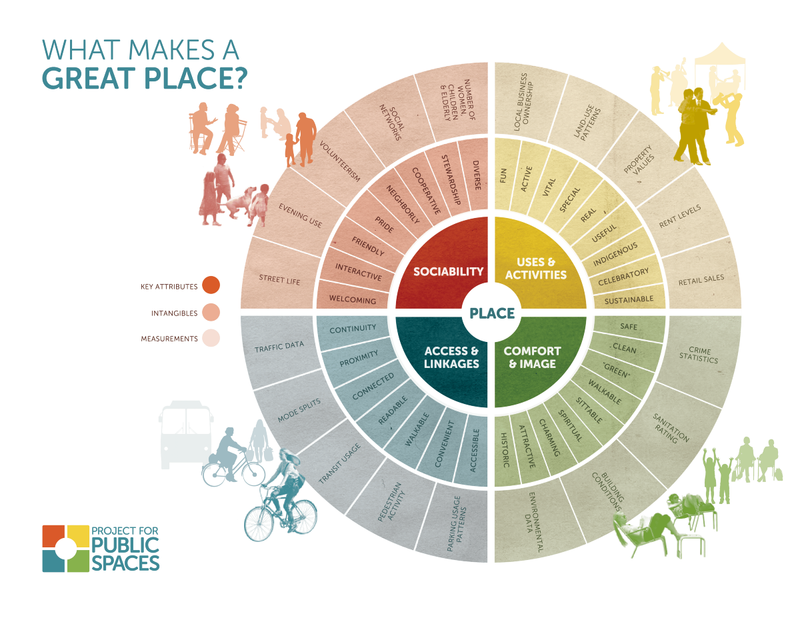 Project for public spaces has illustrated these factors in the following diagram which explains the concept of a successful public space. This indicates that when urban planners and architects construct public spaces, they should keep the above factors in mind in order to make it successful. 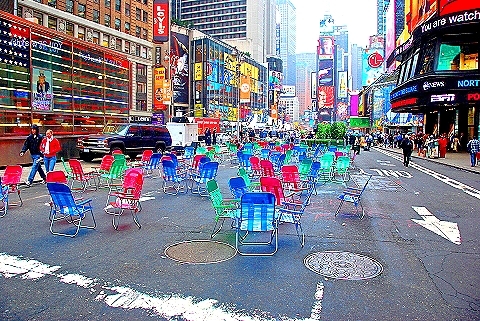 There are many examples of successful public spaces around the world, from Trafalgar Square in London to New York’s High Line Park and Times Square, which embody all the factors mentioned above. While there are many other ways to be creative in public space, these are just a few examples to increase the overall quality of public spaces. Therefore, public spaces should be a valued asset where cities embrace the concept of creating more vibrant and welcoming spaces for everyone to use. This can also be a powerful way to create more positive environments for people to assimilate and come together as a society as described above.